Rapid urbanization, burning of fossil fuels as well as increasing industrialization have intensified air pollution, which is resulting in stimulating the demand for air purifiers. In addition, rising disposable income along with changing lifestyle and declining prices of air purifiers have further fueled growth of air purifier market in India. Currently, the residential sector is dominating the market with maximum revenue share owing to increasing concern regarding indoor air pollution in the country and would lead India air purifier market forecast period revenues. Additionally, in 2017, Tier-I cities contributed majority of the revenue share in the air purifier market in terms of regions due to rising pollution level in Tier-I cities including Delhi/NCR, Mumbai, Bangalore, and Chennai. The India air purifier market report thoroughly covers air purifier market by type, applications, channels sales, installations, and regions. 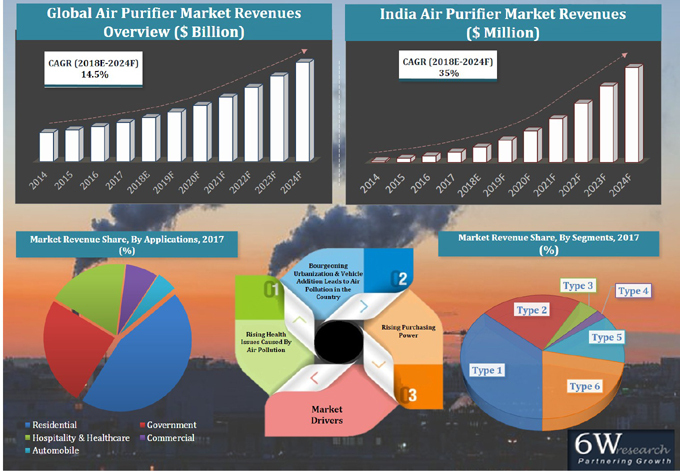 The India air purifier market outlook report provides an unbiased and detailed analysis of the on-going India air purifier market trends, opportunities/high growth areas and market drivers which would help the stakeholders to device and align market strategies according to the current and future market dynamics. 14.2	Honeywell Automation India Ltd.
14.7	Blueair India Pvt. Ltd.
14.9	Panasonic India Pvt. Ltd.